Die letzte Bestellung aus United States wurde vor 7 hours gemacht. 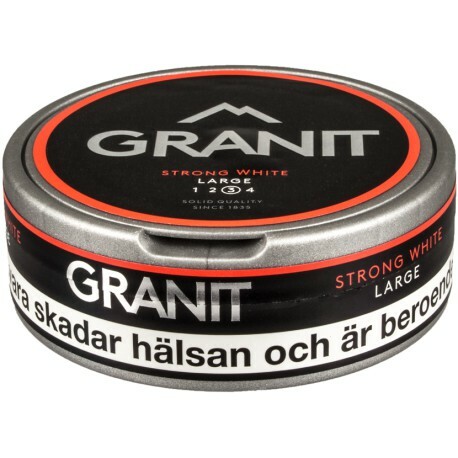 Granit White Portion ist ein preisgünstiger, starker weißer Portionssnus mit würzigem Citrus- und Tabakgeschmack. You really can't go wrong with Granit. Snus comes in many variations, formats and flavors. Many brands have a distinct tobacco flavor but there are flavors like licorice, whiskey and of course mint snus! The two main formats are portion snus (pouches) and loose snus. The nicotine content also varies greatly between snus brands. Which one is the best snus for you is hard to say - you will have to try snus and will find your favorite. There are products like Camel snus, Skoal snus and Marlboro snus for sale in the U.S., but these American products differ greatly from Swedish snus. Swedish snus has a higher nicotine level and longer lasting flavor. If you are looking for an alternative to smoking, snus is a smokeless alternative to cigarettes. The largest snus manufacturers in Sweden, Swedish Match, filed an application with the FDA in June 2014, to have snus declared a modified risk tobacco product and have the four health warning labels on snus packaging removed or changed, including a mouth cancer warning. The FDA has not yet decided on the application.